Frigidaire washers are designed to fit in any home and meet the requirements of modern living. They are not only efficient but also space-saving. One washing machine that can probably attest to these standards is the Frigidaire FTF FTF530. Unlike other front loaders in the market, FTF530 offers simpler settings and configurations to enjoy a clean wash. Its simplicity is among the many benefits of using this washer. Frigidaire's FTF530 front load washer has many reliable features that make it practical for any laundry task. Like other front-loading machines, it doesn't have an agitator but uses the Tumble Action Cleaning System. So even if this washer only has a capacity of 3.1 cubic feet, it can still accommodate more loads compared to traditional washers. It offers more uniform cleaning; clothes are lifted and plunged through water to force the water and detergent through the clothing fibers. This helps wash away sand, stains, and soil. Despite the more thorough cleaning, this washer is still gentle on clothes and doesn't cause advance wear and tear on laundry items. This system is one of the secrets to the efficiency of FTF530. Not only does it operate quietly, it also reduces water and energy consumption. This translates to more saving on utility bills for budget-conscious users. This 5 cycle front load washer has one wash and two spin speed combination and comes with three wash/rinse temperature combos such as hot/cold, warm/cold, and cold/cold. These settings are good enough to ensure a more thorough wash with a clean feel to each laundry item thrown into the washer. The laundering machine can work at heavy or light wash cycle depending on the type of clothing and the kind of wash needed for the laundry items to be fresh, odor-free, and clean. Aside from the stainless steel basket, FTF530 also has automatic dispensers for bleach, detergent, and fabric conditioner. This way, anyone can use this washer with more ease and with less worries for preparation. To prevent leaks, it also has a dependable door lock. Users can also leave it spinning for minutes and just check the end-of-cycle signal to know if it's already time to pull out all the laundry items from the machine and perhaps load some more to start another cycle. This washer can easily find a good place at any home. It can be placed on a pedestal, stacked, positioned under a counter, or hidden in the closet. The sleek design also allows it fit well with the interior decoration. FTF530 is recommended for users who are looking for simpler ways to operate their washing machines. It does a good job at cleaning, and lets users save more in energy and water. Many consumers think that it is a good buy because it's a silent operator, which is nice to have at home. The laundry items, when taken out from the washer, are also almost dry. It also has an adequate load capacity, perfect more small family or moderate size households. Many users have complained about digital controls that are hard to program or set. But because FTF530 offers the basic features, it's easier to set to wash. According to some consumers, this washer has cheap pulley design and the tub also easily fails. The small bleach tray and other dispensers are also one of its disadvantages. With improper use, it is also prone to repairs. So even though it is cheaper compared to other brands, consumers will have to add the repair cost to the bill. Some users also wish that it has more wash and rinse cycles for a more thorough washing. The smaller capacity also limits the number of laundry items that can be loaded. Frigidaire's FTF530 is certainly not of the most sophisticated washers in the market. Aside from its smaller capacity, it also has limited features. For people looking for flexibility, this is one of the main disadvantage. 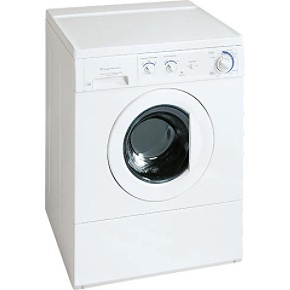 But despite its shortcomings, this washer is still a good option for those who are looking for an efficient wash minus the hassle of having too many controls and options. It has a decent price and can perform well in washing away stains and dirt from clothes and other laundry items. It doesn't cause wear and tear but cares for different types of fabric. In the end, there are still good reasons to invest on this washer. We have had ours for 13 years, family of three. During that time, one repair, due probably to our forcing the dial too hard. Finally came to the point of needing new bearings on the tub, and that is an expensive repair. Now ... Front load washers are superior to top loaders in many ways. This model fit in our 1950s house laundry closet. New front loaders are too deep. I would buy this model again in an instant if it were still made. But I am having to buy a compact front loader, 24", smaller tub, more expensive. I hope appliance makers remember the millions of houses built when appliances were not as big as they are now. Appliance showrooms look like Hummer dealerships these days. I had my washer for 11 years, moved it 4 times across the states and NEVER needed any work done on it. I only got rid of it last year then we moved overseas. Gave it to my sister. It's still going great for her. I will buy this again when I come back! We got this washer installed in 2009, and in the first year we sent for repairman because it wouldn't drain water. Was told this is a flaw of this design and to clean the drain out every 6 mo to avoid more repair costs. Apparently this model is the only one that has a drain plug that chronically has to be pulled and cleaned. This month the motor control board went out, rendering the washer unusable, and the cost to repair was almost as much as the cost of the unit to purchase. The smell of mildew was chronic (in the rubber of the door? ), and we found it loud when it drained and spun. We are avoiding Electrolux/Frigidaire permanently from now on. We bought the matching washing and stackable dryer/combo for our summer home. With only my husband and I the washer was not used very heavily and although we had the washer and dryer for five summers, the use was less than a full year. The cost of repairing the washer was going to be more than buying another one or at least the same. The problem was in the gears. Machine is exactly 9 years old and has major repair issues with the drum mechanism breaking down. First repair was under 5 yr. warantee, the back of the drum supports broke. Now, the same thing, drum mechanism broke again. One might as well buy a new machine since purchaser is responsible for paying labor to replace part. Conclusion; the drum is under engineered and should have been redesigned years ago, yet, even the new machines still use the same part. I have had this machine for close to ten yrs, it is the best investment we have ever made. It works great and would not trade it for anything. I is still going strong. The only issue with it has been a recalled shock like mechanism that attaches to the drum, which was a cheap and easy fix, one we were able to do ourselves. My husband is a welder so his cloths get plenty dirty and this machine can handle it and clean them. Its capacity is a bit small but I am amazed at what I can put in it. A must have in any household. the life cycle of this product was 2 years 3 months. my uncle, a HVAC engineer and electrician, took apart this machine and could not fix it. I will never buy Frigidaire again. I just ordered a Whirlpool. won't spin dry in the final spin cycle, quite a common problem for this model. disappointing for less than 2years of service. will try different ways to see if i can repair it. if not, a new machine, not frigidaire for sure. I purchased this machine close to 10 years ago to replace my 30 year old Kenmore top load washer.I chose the front load design for it's water saving effiency.I have had no problems with this machine except for the recent problem of the fabric softener dispenser not emptying completely leaving me with water left in the dispenser and not being able to fill it for the next load.Sadly it has started to make a loud clunking noise as the drum rotates and I fear (from what I have read from other reviews) that the bearings have gone kaput!The repairman is coming out this week-end to see what the problem may be but I think I may be looking at buying a new machine.I would definitely look at another Frigidaire based on my experience with this machine,considering that my sister's top-of-the-line Kenmore front load washer gave up the ghost on her after only 5 years! This Frigidaire washer works great for the most part, but it has some annoying down sides. The great side to this washer is that it does its job; it gets DIRTY clothes and linens clean. I have put some really dirty yard work clothes and shoes in and they came out like new. It has various cycles for heavy duty, delicates, etc. and you can adjust the levels of heat, soil level, etc. Secondly, it is an energy star machine (which often means a tax refund/rebate) and is very energy efficient. This helps with the energy bill! But there are some major issues with this machine. Most problematic is the front load design. There is a rubber guard around the opening that often catches delicates, and, especially if you overload the machine, fabric will get caught by the rubber and tear your clothes / linens / garments... I really expected this machine to hold larger loads. The other major problem with this front load opinion on this machine is that, in the process of pulling out wet clothes and switching them to the dryer, water and 'gunk' caught in the rubber lining will spill out onto the floor. Sometimes you can put the load on an extended cycle to help wring out the laundry, but usually I just have to clean the floor in my laundry room every time I wash clothes. Plus the ‘gunk’ that gets caught in the rubber is really gross and always soaking wet (imagine pulling hair out of a drain and you get the idea). It does its job, but makes a mess in the process. I have no idea what the first person is talking about. This Machine has served us well for many many years without a single issue. The machine uses very little water and cleans great. Yes, it does sound like a jet taking off in the spin cycle, but that makes sense as its spinning at close to 900 RPM!!! and yes it's going to make a bit of noise... The only thing that bugs me about this machine is the finished buzzer... it will make you jump if you don't expect it. We bought this washer in October of 2005 to replace our old Inglis top load which we had for 28 years without a problem. Now, after less than 4 years, the basket assembly has broken requiring a repair for about $500. The serviceman told us that this is quite common because of how they are manufactured. In fact, the life expectancy is only about 5 years. He suggested that we buy a direct drive top load. Stay away from this model and buy a front load only if you have checked its quality. Due to a relocation we were forced to purchase a new washer and dryers We love this washing machine! We were able to get a great deal on floor models and choose this model because of is quiet running motor. The only time that it is noisy is when it spins the clothes out. Then it sounds like a jet taking off. I think the noise makes the machine sound powerful. I can't believe how quiet it is compared to our old Kenmore washer. I love the look of the machine also. It is very sleak and stylish. I am delighted that they have buttons and not a touch sensitive panel. Several friends have had problems with the touch panels going bad and requiring expensive repairs. This is our first ever brand new washing machine and the first ever front loader. It might be new owner pride but the clothes come out cleaner with less detergent used. Stains that would have required hand scrubbing come out with out a problem. I have noticed that loads take a bit longer to wash in this machine than my old one, but a small price to pay for the cleaning it does. I also like the variable water feature. You use only the water you need for the size load you are washing. This saves a lot when you are paying high dollars for water. Also saves a lot in detergent money and shave a alot off of the wash and spin time. My parents have been long time Frigidaire fans, and have had good luck with all their appliances. So far I am very happy with the washer and dryer. I would buy another one in a flash, but I think this one will last a very long time. Great washer for the money, and to save money also.